Funeral Directors David Crymble & Sons have been serving the people of Belfast and other communities throughout Northern Ireland since 2004 from its premises on the Lisburn Road, South Belfast. The business is family owned and family run and prides itself on being able to serve you. Since first opening their doors they have arranged and provided funeral services throughout Ireland. David Crymble & Sons offer tailored funeral plans which may be pre-planned or prepaid and are happy to advise, without charge, on any existing funeral plan. They also offer a bespoke design service for new memorials and can clean, repair or complete inscription work on existing memorials. The new site has been completely refurbished to meet your needs, provide bespoke facilities and offer an outstanding level of service to the people of East and South East Belfast. 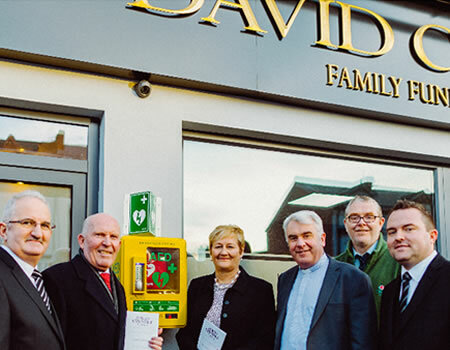 In a statement the company said "We are delighted to announce we have installed an automated external defibrillator (AED) at the front of the premises for the use of the local community. Locally this is the only defibrillator that is accessible 24 hours per day." It continued "Watch the local press and facebook as we will be arranging training on this equipment for shopkeepers, churches, community groups and local residents." To mark their arrival on the Woodstock Road the company held an official Opening and Service of Dedication on Sunday 20th November 2016 and stated "We pride ourselves on our commitment to our clients, their families and the community at large and, to this end, we will work closely with local Churches, Charities and Community groups. You are more than welcome to call in to meet with David, Joy or Andrew Crymble, have a coffee and view the facilities personally".